Bruno wasn’t the fastest dog to get adopted under my charge – that honor goes to Moe, a Dachshund who left me so quickly (in three days), I didn’t even get a photo of him – but he came close. Exactly one week after I took him in, Bruno found his forever home with a warm and loving woman, Lynette Oana, in San Mateo. Lynette recently lost her longtime companion, a beautiful Australian Shepherd she had cared for since his puppy days. Because he died the same week as Franny, it was somehow poetic that the first foster dog I took in after her death was also the first dog she adopted after suffering her own grief. Lynette has so much love to give and I am absolutely certain Bruno will love his new life with her. Bruno’s adoption would have happened a day earlier had it not been for something I had noticed over the preceding days: this treat monster kept refusing to eat his meals. In the beginning, I thought that maybe his teeth were bothering him – he had eight pulled two weeks prior. I switched to feeding him only wet food to see if that would help. It didn’t. When he did eat, it was gingerly. He seemed to have trouble picking it up out of the bowl and often dropped it from his mouth. It was a bit better when I fed him little meatballs of wet food by hand but he still wasn’t exhibiting the eagerness I would have expected, given how interested in treats he was. On Monday morning, I made him an appointment at Pets Unlimited to have his teeth checked out. Lynette was scheduled to meet Bruno that evening and I wanted to know what was going on, and get him the treatment he needed, before he began his new life. Dr. Sierra greeted us warmly and listened closely to the problem but when he tried to look in to his mouth, Bruno gave an ominous growl. ‘Unfortunately,’ he said, ‘we are going to have to bring him in to the back to sedate him so I can get a good look inside.’ He said he could reverse the sedation but that Bruno would probably be pretty dopey for most of the evening. When Bruno disappeared in to the bowels of the pet hospital, I called Lynette to postpone our meeting until the following day. I wanted her to see Bruno in his best light, not as a groggy little man. Over an hour later, as Bruno was waking up from the sedation, Dr. Sierra came out to describe what was going on. He saw what he believed was a secondary infection from his teeth extraction two weeks ago. He showed me a photo of the inside of his mouth where he had big angry rash-type spots blooming on the inside of his lips in the same spot Dr. Sierra had tried to lift earlier that afternoon. 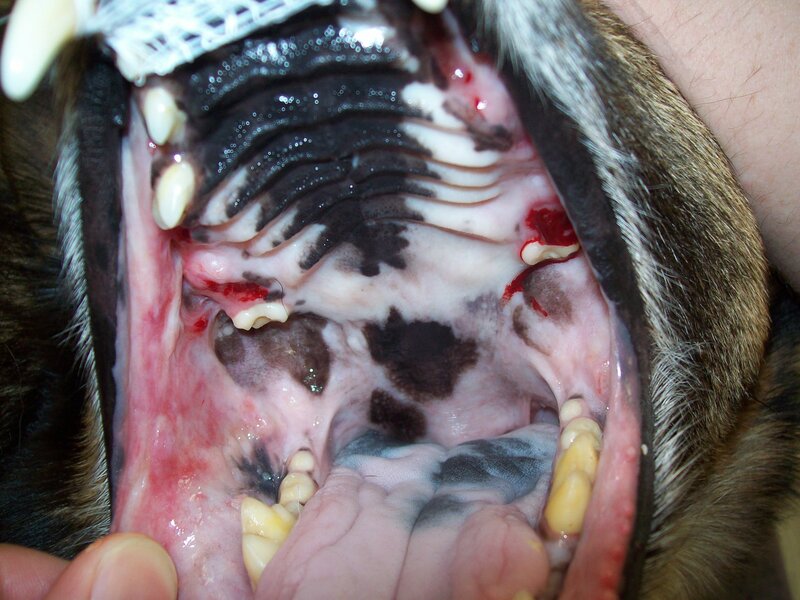 He suspected that the antibiotic Bruno was given following his dental work was a type resistant to this kind of secondary infection and put him on a course of a different form of antibiotic and painkiller/anti-inflammatory. The inside of Bruno's mouth. Notice the red rash on the left side. When a dog refuses to eat, especially one that is a vacuum cleaner like Bruno, a few things might be going on…and none of them are good. Dogs that are highly stressed will refuse to take food; but this is usually triggered by an outside stimulus (a scary environment, an evil stranger, a ornery dog) and is often accompanied by other signs of stress including lip licking, yawning, stiff posture, and a tight facial expression. The other possible reasons are health related. In Bruno’s case, his refusal to eat was directly associated with pain in his mouth but not eating can also be caused by other kinds of pain – internal or external. In general, if your dog refuses to eat or shows a major change in his eating behavior in non-stressful conditions, it is probably worth it to take him to the vet to try to determine what is going on. Unfortunately, if the pain is not in the mouth, this can be difficult…especially if the refusal to eat is related to something like cancer. When a technician brought Bruno out for me a few minutes later, the poor guy could hardly walk he was so out of it. When he got to me, he splayed out on the floor with his head on my knee. I scooped up all 35 lbs of him and struggled two blocks to the car. When I set him inside he looked at me and jumped back, startled, as if he hadn’t spent the last ten minutes like a bowling ball in my arms. But by morning, Bruno was back to his old self – his mouth still in pain, but his eyes bright and his tail wagging, ready to be adopted later that day. Congratulations to Bruno and Lynette and thanks to Muttville for saving this wonderful dog!